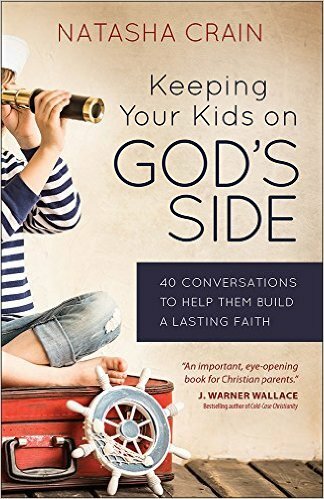 “Keeping Your Kids on God’s Side: 40 Conversations To Help Them Build A Lasting Faith” by Natasha Crain (Harvest house Publishers, 2016) is a book I’ve been highly anticipating for the past year. Natasha is founder of the very popular Christian Mom Thoughts website, the Christian Parenting Blog, and the Apologetics for Parents Facebook group. Natasha is a wife and mother who left her corporate job to make a difference in the lives of families. Her new book (available March 1, 2016) is a great step in doing just that. I’m a father and grandfather and have worked with children and youth ministries for almost 45 years. I’ve seen a lot of Christian books written for parents to help their children. Many are okay, but few are outstanding. Keeping Your Kids on God’s Side is definitely one of the few. It is an outstanding guide for parents and comes at a key moment in history when Christian families are under some of the most intense attacks the world has seen for a long time. I was raised by Christian parents and spent my childhood and early teen years in church, but was led toward atheism by many of the challenges Natasha Crain has listed in her book. Chapter 1. What evidence is there for God’s existence? Chapter 2. How could a good God allow evil and suffering? Chapter 3. why would God command the genocide of the Canaanites? Chapter 4. How can a loving God send people to hell? Chapter 5. How can God judge people who have never even heard about Jesus? Chapter 6. Why would God need people to worship Him? Chapter 7. Why is God so hidden? Chapter 8. Is faith in God the opposite of reason? Do any of these questions sound familiar? If you are a parent or work with children and youth, I’m sure you’ve heard them. You’ll find that to be the case with all five categories. They address some of the toughest questions our kids will ask. Giving them great answers can make a big difference as they make the Christian faith their own. I highly recommend Keeping Your Kids on God’s Side for every Christian parent, grandparent, pastor, church leader, and adult who works with children and teens.